There is a little train in Hermann Park. Hermann Park has had train for decades (I rode it when I was a whippersnapper), but this is an all-new train--somewhat bigger (it can accommodate wheelchairs and strollers now) and the track is longer. Now they are also installing a lot of new art for one year as part of a celebration of the centennial of the park. Not all of it has been installed yet (there will be pieces by Louise Bourgeois, Ugo Rondinone, Sharon Englestein and Orly Genger--but not yet), but you can see all the new art that's up--as well as art that's been there for a long time--from the train. I got on the train at a station near Miller Theatre. The first piece of art you see is Atropos Key by Hannah Stewart (1928-2010) on top of the hill in front of the theater. 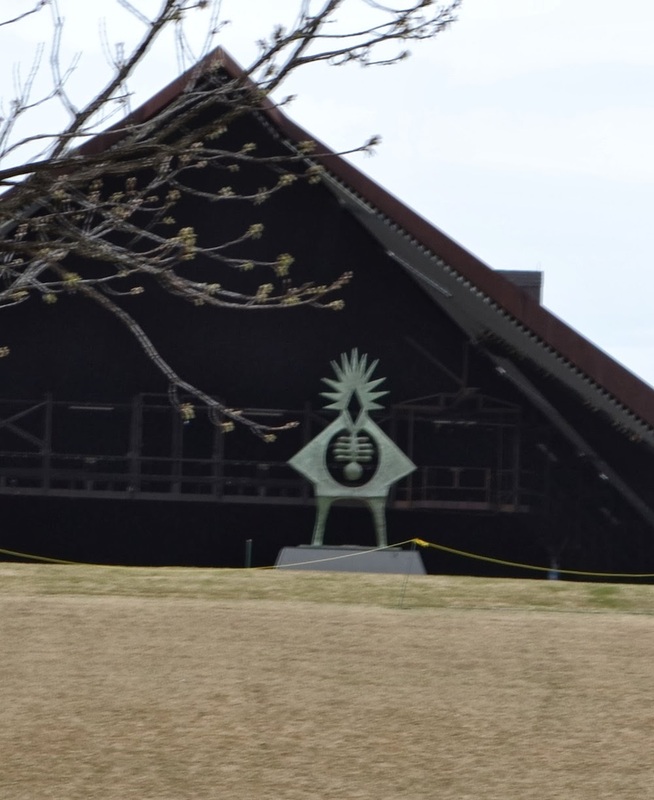 This sculpture has been keeping watch from this hill for 42 years. For me it recalls surrealist sculpture, and with the Greek mythological reference (Atropos is one of the fates), it has a Jungian thing going on. I like Atropos Key a lot. This abstract female figure, watching down both sides of the hill--into the theater and over towards Main Street, is a comforting presence. The next piece you see is one of the temporary pieces. Wind Waves by Yvonne Domenge is another bronze sculpture. Atropos Key feels hand-made and feels like it belongs where it is. That's probably because I've been seeing it there for so long, but the contrast between it and Wind Waves couldn't be more obvious. Originally shown at the Vancouver Biennial in 2009-2011, Wind Waves is a piece of plop art that has no particular relationship to the location it happens to be occupying for a year or two. It's a generic beautiful object, eye-catching and pretty but empty. I don't hate it--it's too generic in fact to invite any emotion at all. Next up is the Pioneer Memorial at one end of the reflecting pool. This is also pretty generic, but it's the kind of thing you expect to see in a city's central municipal park. By the way, this message in the train really applies to your whole life. There us an area by the playground where two sets of tracks run parallel. We will return on the other track. The park was full of people on Saturday. Families, kids, teenagers, joggers, strollers, cops (lots of them for some reason) and this gentleman taking a nap near the intersection of Main and Cambridge. Then the train approaches a green shed--the location of the next piece of art. When we exited the tunnel, the kid behind me shouted, "Cool!" That is the perfect critical judgment. As the train crosses McGovern Lake, you come across the next work of temporary art, an untitled twig building made by Patrick Dougherty and 150 volunteers. Like Hancock's piece, this seems like a perfect piece for the park. It's interactive (you can enter the building) and likely to appeal to a broad cross-section of park-goers. Especially kids. In fact, people who interact it may not see it as a piece of art at all. Now we cross by the other end of the reflecting pool, where we can see the Sam Houston Monument (1924) by Enrico Filiberto Cerracchio. Bronze monuments to hero/founders are the ultimate municipal art cliche, but I'd feel something was lacking if a park like Hermann Park didn't have one. It helps identify the park as a civic space. And Sam Houston was a cool guy. The name of this train is the Dr. Jack Express. I have no idea who Dr. Jack is. Jim Love's Portable Trojan Bear has been here since 1984. This is another piece that seems to waver between being an artwork and being a piece of playground equipment. Like so much of Love's work, it's cute and lovable--qualities that probably kept him from being taken seriously as an artist outside of Houston. But Houston loves him--you can see a couple of his pieces next door at Rice University, the wonderful plane at Hobby Airport, and until very recently, a lovely giant red jack at the Menil. And that's it. All photos were taken from the train in motion--I apologize if a few are a bit fuzzy and poorly composed. I hope the additional sculptures being installed for this centennial celebration will also be visible from the train. I'd love another excuse to ride it again. No Seriously, What’s the Matter With Rice?